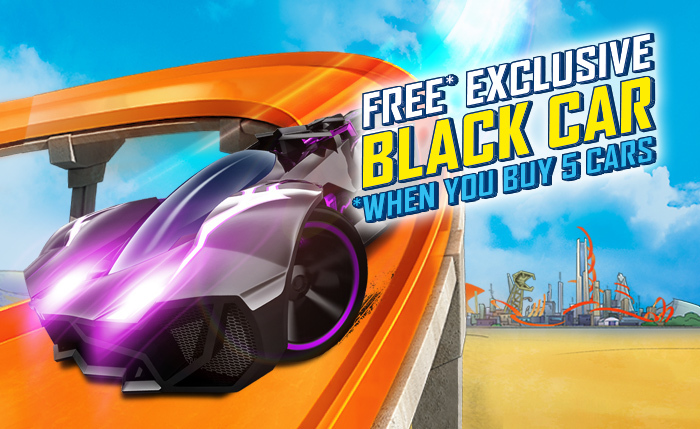 Get a free Limited Edition Hot Wheels Black Car! …when you buy 5 Hot Wheels Diecast cars! There’s chaos in the Hot Wheels racing world right now, with sightings of an awesome Black Car tearing up race tracks and leaving competitors in its tail smoke! The good news is this exclusive model can be yours! Kick off your collection or add to your line-up with five Hot Wheels Diecast cars and you’ll get your very-own limited edition Black Car! Then sit back and wait for your Black Car to arrive! So what’re you sitting around for? Get yours now! My 3 year old absolutely loves hot wheels, best Christmas present ever.